What NOT to cook in your Instant Pot: A pressure cooker is NOT good for ALL recipes. Avoid pressure cooking FAILS by avoiding cooking these items in your pressure cooker. An Instant Pot or Electric pressure cooker is a great tool to speed up the cooking process of many dishes. Tough meats are made tender, like in Instant Pot French Dip Sandwiches. Frozen chicken breast cook up perfectly in less than 10 minutes. Homemade yogurt is a breeze in the pressure cooker. You can even perfectly thaw out frozen ground beef in the pressure cooker. But a pressure cooker is NOT good for ALL recipes. 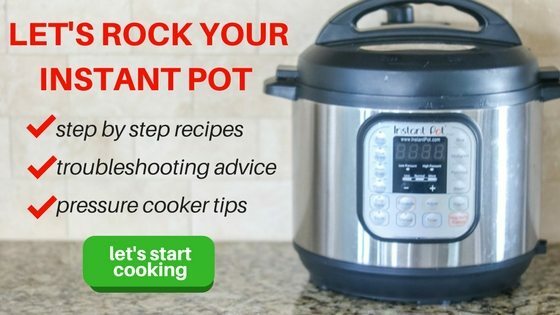 By now, hopefully you know the Instant Pot Basics, and how the Instant Pot Functions work. But as you try to figure out WHAT to cook in your pressure cooker, you MUST first remember what NOT to cook in your Instant Pot. Thickeners: Adding cornstarch or flour to your recipes at the beginning of pressure cooking can cause your food to burn or for the pressure cooker to not reach pressure. Instead, add a slurry at the end of the cook time and let simmer on the saute function until the sauce has thickened. A slurry is a mixture of flour or cornstarch and the cooking liquid added at the end of cooking. I like to use 1/2 cooking liquid for every tablespoon of thickener and then slowly whisk into my cooked dish. If you have a corn allergy, use a mixture of arrowroot powder and cooking liquid in place of the cornstarch slurry. Dairy — Adding dairy to the beginning of the cook time of pressure cooking can cause milk/cheese/yogurt to curdle or separate. It can also cause your pressure valve to get clogged as dairy will foam at a high temperature. This will mean your pressure cooker will not come to pressure as expected, and will be a reason your instant pot may not seal. It is best to add any dairy product, like milk or cheese, to a recipe at the end of the cooking time, and let it finishing cooking (or melting) using the saute function. The exception to this rule is when using pot-in-pot method for things like Instant Pot Oatmeal or Instant Pot Cheesecake. Breaded meats— Even when placed on a rack, breaded meats or vegetables are not recommended due to the fact that the the breading will get soggy as the pressure cooker cooks with steam. The breading may also fall off the meat and cause burning on the bottom of the pressure cooker. Quick Cooking Dishes–The whole purpose of using the pressure cooker is to take a long cooking process and shorten it. If a dish already cooks in less than 20 minutes, using your pressure cooker will NOT save you time, in fact it may increase the amount of time–as you have to wait for pressure to be reached and pressure to be released. Bread –There are recipes for Instant Pot Bread out there, but a pressure cooker will never yield a crusty exterior and the process of baking bread is quite precise. Proofing bread in your instant pot is a GREAT idea–baking, not so much! Cookies –You may have thought I lost my mind on this one, but there are so many recipes for Instant Pot Cookies. The verdict? They are horrible–and take much longer than oven baked cookies. Canning — There is evidence to support that an electric pressure cooker does not get hot enough to kill bacteria required for safe canning. In my book, it is not worth the risk. Bottom Line: Remember that pressure cookers work with moist heat. Any dish that you want to achieve a crisp crust or a reduced sauce, will not be able to be achieved in the instant pot.